Some of the old volcano top orthos are some of my favorites. The old Meade 2" wide view in the 14mm and 32mm are some favorites. The old University 32mm Konig is an all time favorite for just finding things and a great eyepiece for removing splinters. The old Zeiss .965 orthos are really great. Edited by starman876, 12 June 2018 - 08:14 PM. Tough question, probably a toss up between my old Celsetron 16mm erfle and my 7mm Meade RG ortho with my 24mm TV WF a close second though could be others depending on how you define vintage. 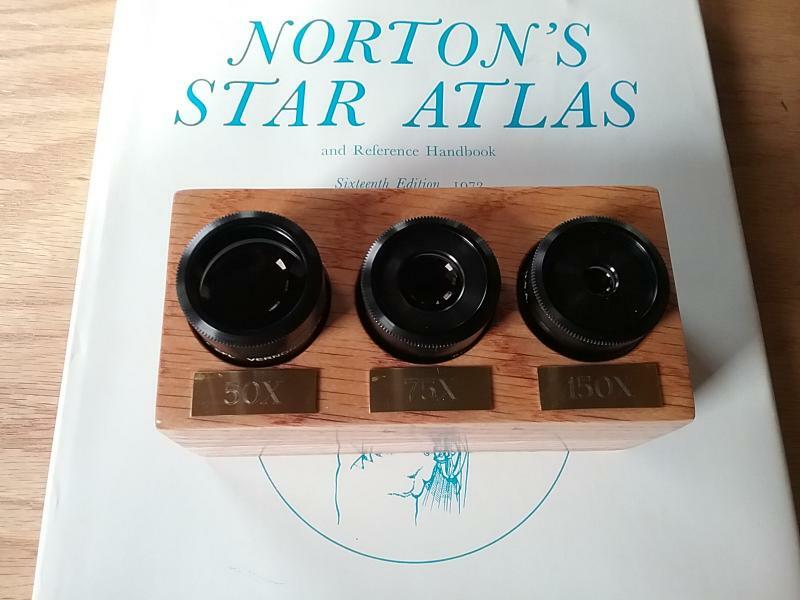 Classic Celestron Ultima series that came in the striped boxes, Not the recent Duo. My favorites are the Meade Research Grade. caps 'MEADE' or 'Meade' I have a mixture and they are all fantastic. Edited by clamchip, 13 June 2018 - 04:03 AM. My University Optics 16mm Konig is an outstanding eyepiece. Had it since 1977 and will never let it go. Not the widest field of view but super sharp and flat to the edges. The best for planetary. My small set of 24mm, 16mm, and 8mm Brandons. Note: I recently replaced the rubber eyecups with flat top adapters to gain a little more eye relief. Edited by steve t, 12 June 2018 - 09:26 PM. Meade Research Grade 20mm inch-and-a-quarter. Made me a better observer. Otherwise, I’d be happier selling classic EPS to one of you. Modern wide field EPs is one of the few things I truly like now vs then. 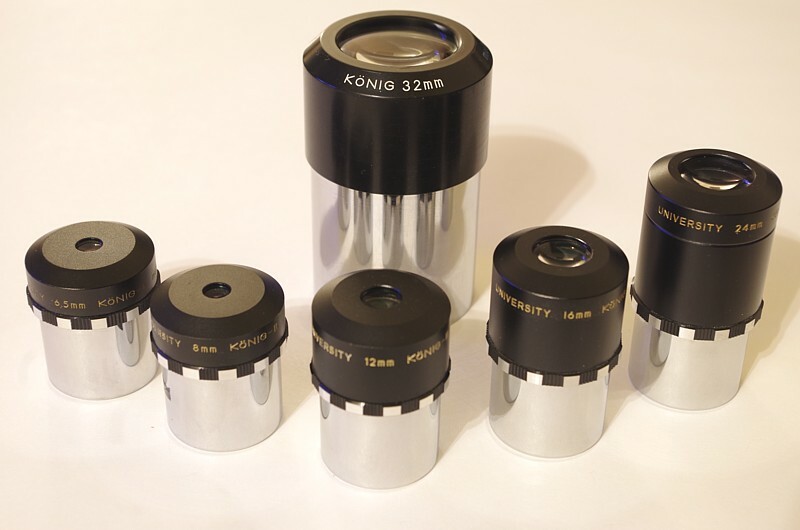 Given that they're from the same Era as the Meade Research Grades and predate some the eyepieces previously mentioned, I would say the 32 mm TV Wide Field (1982) and the 4.8 mm Nagler (1980). The 32 mm WF is really a special eyepiece , it's not as sharp off -axis as the 31 mm Nagler or the 35 Panoptic but its pretty good and its got that big eye lens that makes for a "big easyview ." i was using it the other night, wonderful views under dark skies on the 16" F/4.4 fitted with the Paracorr . - 4.8 mm Nagler. it's short on eye relief but sharp across the field. . I call it my Nagler Ortho. That eyepiece was introduced 38 years ago . It still holds its own. I actually like the Huygens and Kellners that come with classic scopes. Part of the ethos. The H12.5mm and K22mm are great eyepieces. I sort of enjoy snuggling up to the 9mm and 6mm Huygens and Mittenzweys. I draw the line at the 4mm Special Ramsden - what exactly is special about it?. That eyepiece is useless At f/15 those eyepieces are too much power. Objectively speaking, if you can get a good central image of Saturn with a 2-element eyepiece, what more could you possibly want? Circle NJ TeleVue stuff or go home. I don't care for any of the older stuff that has nose bleed ER or narrow FOV's. The 32 mm WF is really a special eyepiece , it's not as sharp off -axis as the 31 mm Nagler or the 35 Panoptic but its pretty good and its got that big eye lens that makes for a "big easyview ." i was using it the other night, wonder views under dark skies on the 16" F/4.4 fitted with the Paracorr . I always loved the NJ 4.8mm Nag. I like my old UO Circle A eyepieces (5mm, 6mm, 9mm, 12.5mm, 25mm, and 40mm. Somehow the coatings on my original 4.8 Nagler were damaged so I recently bought another one..
One interesting fact about the smoothie 4.8 mm is both the barrel and the body are 1.25" diameter. The fit in the focused backwards. I make use of this fact in the test jigni j use to measure the effective aperture of my refractors. Interesting, I still have mine I bought new and it is the least used eyepiece I have. The eye relief just does not work that well for me. Glad it works for you Chas. I've never been able to use a Nagler comfortably. Besides the short eye relief, they are not as sharp in the center of the field as a good ortho, and some of them "kidney bean" on me. Just too finicky. My favorites are my old UO Zebra Konigs as well as the volcano-top Erfles. Both work very well in long-focus instruments. I have some other faves but these are the ones that seem to get used as a group most often, along with the UO mushroom-top series. No pics of the mushroom tops on my office computer, sorry. Man those are beauties! Agree about eyepieces with lots of SAEP. Not fun. Mine are the Clavè 8mm and 12mm for planetary and moon. 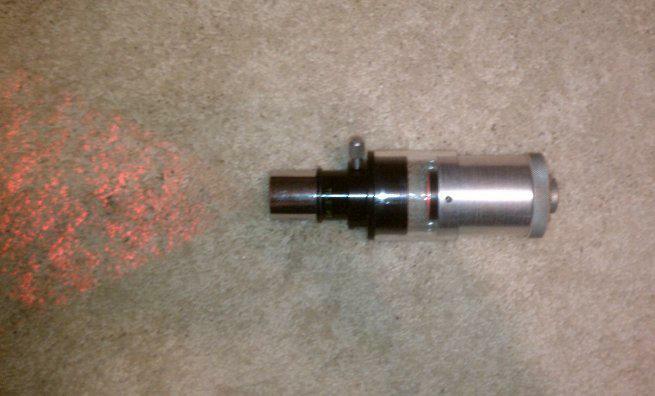 And the 30mm Criterion I got from Brian D, that is like new. They all give great views! Edited by Dartguy, 13 June 2018 - 08:42 AM. RGO's are at the top and mine were competitive with a ZAO. Even the Multi coated Tani Orthos are just a notch down from the top tier ridiculously priced ZAO's. The 2" Edmund Rank 32mm is superb. The early green lettered EP's are very good too, but I find the Ortho's easier to look through. Performance per dollar? A good Tani Ortho is hard to beat. Clave' and Brandons are similar, little scatter, tight on eye relief and rather poor off axis. Had quite a few of each. Kept an 8 and 12mm Brandon. Still like the RGO's better. I have that 20mm and the large heavy circle T 32mm Erfles and really like them. The 32mm is my de-facto widefield ‘finding eyepiece’ in my OT C8. Agreed! I love my old Celestron and Edmund 1.25” Volcano-top Circle T orthos. I have the full set from 4mm to 25mm. Also my 7mm Meade RG ortho and my 25mm and 40mm Volcano-top Celestron Circle T Kellners. Of course, my prizes are my set of four CZJ (0.965”) orthos, my five Brandons, and my two Galocs. Edited by terraclarke, 13 June 2018 - 09:49 AM.